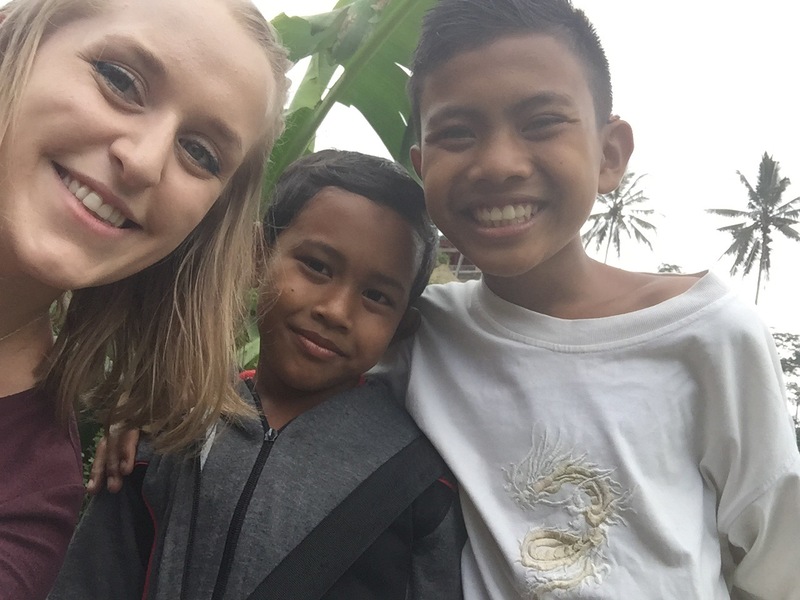 On our second day in Bali we hired the same driver as the previous day and headed to Ubud. We had organised to do a tour on the way to our homestay so had a lot packed into the day. We left dry roads and beach shops and entered greener surroundings of the jungle and rice fields. 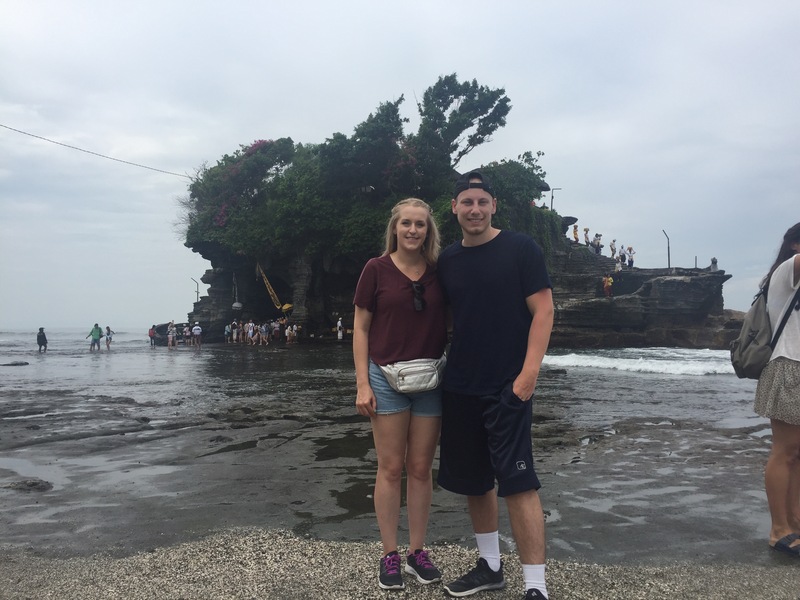 Our first stop on the way to Ubud was Tanah Lot Temple. 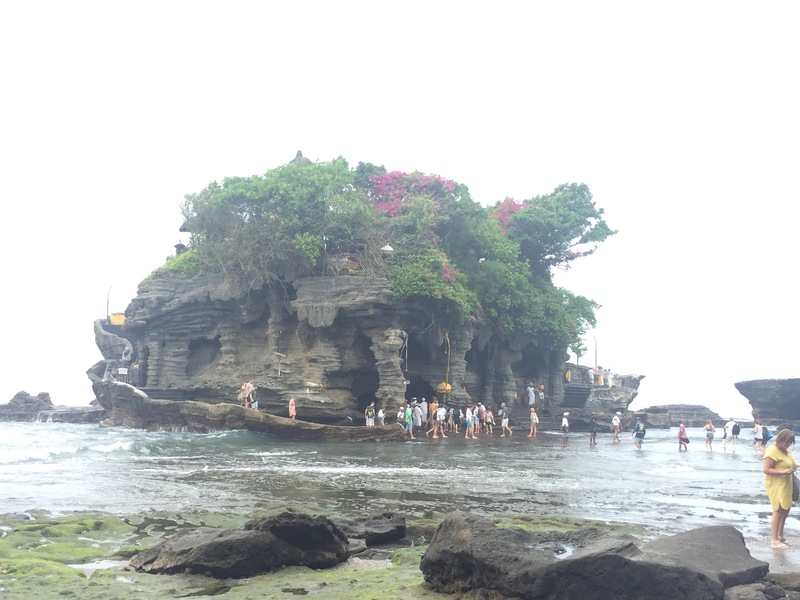 This is a temple in the sea and you can only get to it at certain times of the day depending on the tide. We got there around 10am which must have been during their morning worship as there was chanting over the speakers and a lot of people praying. The locals headed towards the temple in formalwear and carrying woven baskets on their heads – I think this will have been filled with offerings such a incense and flowers to leave at the temple (I can’t be sure though). They would leave their flip flops on the rocks and then cross the sea to receive a blessing which involved having rice stuck onto the middle of their forehead and some sort of powder put on their faces – we didn’t go into the temple itself because we had trainers on so I couldn’t see properly what was happening. This seemed to be linked to the water being holy as a sign on the temple read ‘Holy Spring Water’ and crossing the sea seemed like a mini pilgrimage for the Balinese. There were also smaller temples on the mainland within the site which people would also visit to leave offerings. It was good to see the temple being used, it’s a spectacular place to go and worship. To get to the main temple you had to walk through a market which sold nicely patterned clothes and Bali memorabilia as well as wood carvings and paintings (this was not actually the most direct route to the temple but they put signs pointing to the temple to make you walk through the market). While we were walking around we noticed that every shop had a small basket made out of a leaf which had flowers and burning incense in it; we had seen these on the streets in Kuta too so we think it is to bless the shop and give them a good sale day. By the time we reached our next stop – the Taman Ayun Temple Mengwi – it was the middle of the day so very hot and sunny. This temple was built in the 1600s by the royalty of the time to bless the kingdom. 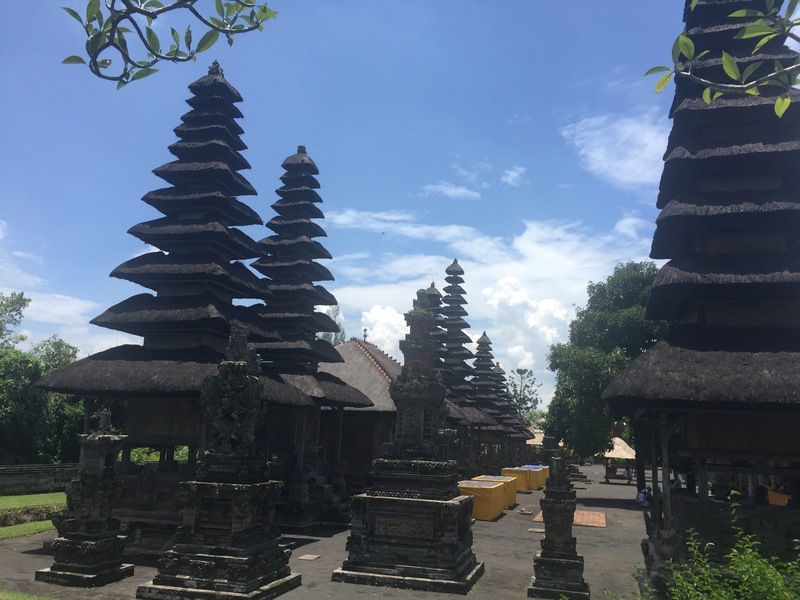 The temple is surrounded by a moat and has a lot of grand towers which, to me anyway, is in typical Indonesian style (very tall and thin with tiered roofs). As well as the main temple, there were gardens with flowering trees and butterflies in the centre as well as walkways around the edge through tall trees and vegetation that you could walk along. 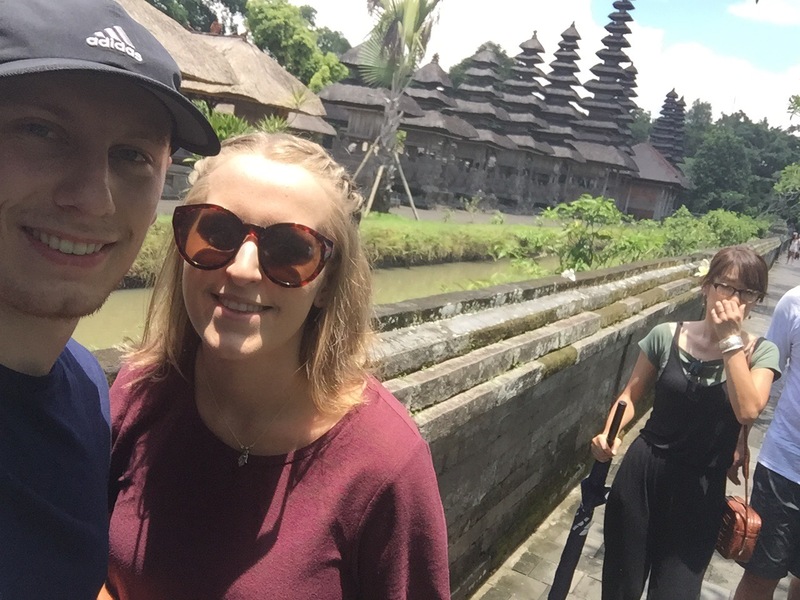 We only did a short stop off here but I’m glad we did so that we could see the different types of temples Bali has. 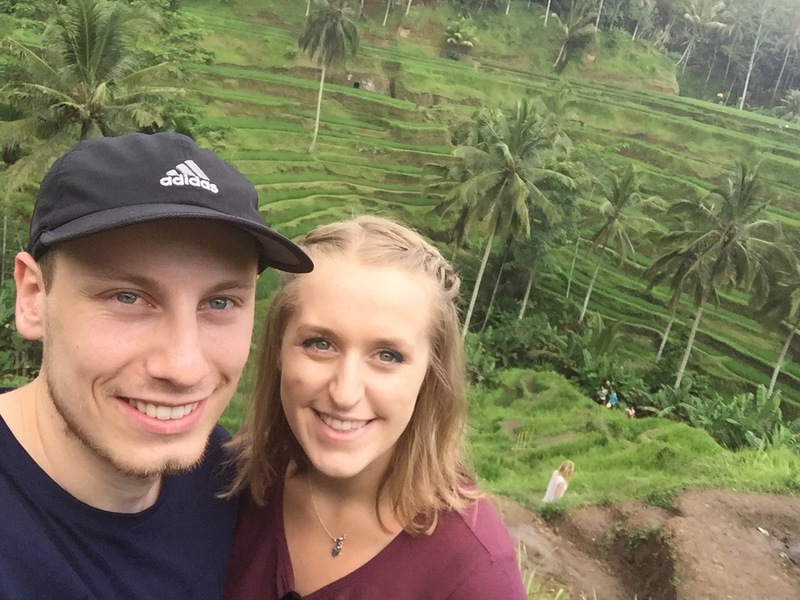 Next we visited an iconic scene in Bali: the Rice Terrace. Just as we got there it started raining heavily for around 20 minutes making the walkways more slippy and muddy. The view of the rice Terrace is breathtaking as it has a mass of green ledges in the hill with rice growing in watery ditches. We ventured down the Terrace a bit but it involved a lot of jumping and drops and my knees weren’t coping with it so well so I waited mid-way down and Niall carried on down to the bottom and over to the other side on his own. 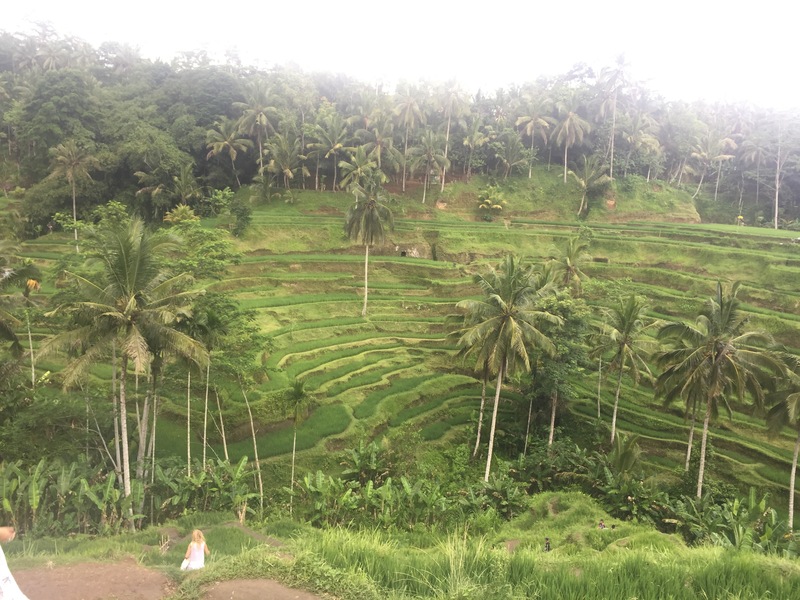 There were children on the rice terrace trying to sell post cards to make some money, they were very good at navigating the terraces and knew the best ways to get up and down. When I went to get back up the Terrace, two children shouted to me and quickly came down to help me get to the top (I didn’t want to get muddy which made getting up myself a struggle). They helped me balance and pulled me up higher ledges so, as a thank you, I bought some postcards from them and we got a photo together. They were very nice and polite and they even told me to be careful with my money after I paid them. I saw one of the boys later on and he shouted hi to me. 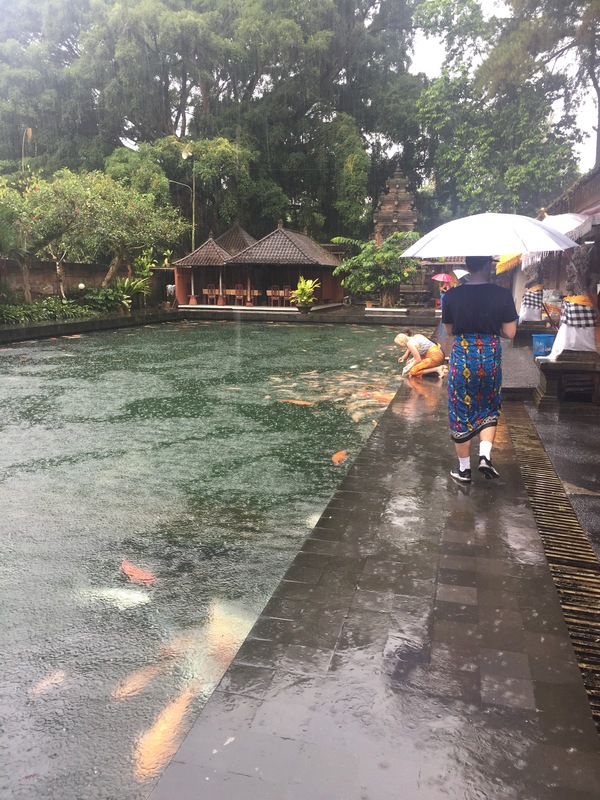 During the heavy downpour (which lasted a couple of hours this time) we went to Tirta Empul Temple which is the temple of the Holy Spring. Nyoman (our driver) gave us umbrellas and we had to put on sarongs before we went in to cover our legs. The rain added something to this temple as the focus there is on the purifying nature of water. People go to ‘self cleanse’ in large pools with a number of stone tap/fountain like things in the sides which wash water over their heads. 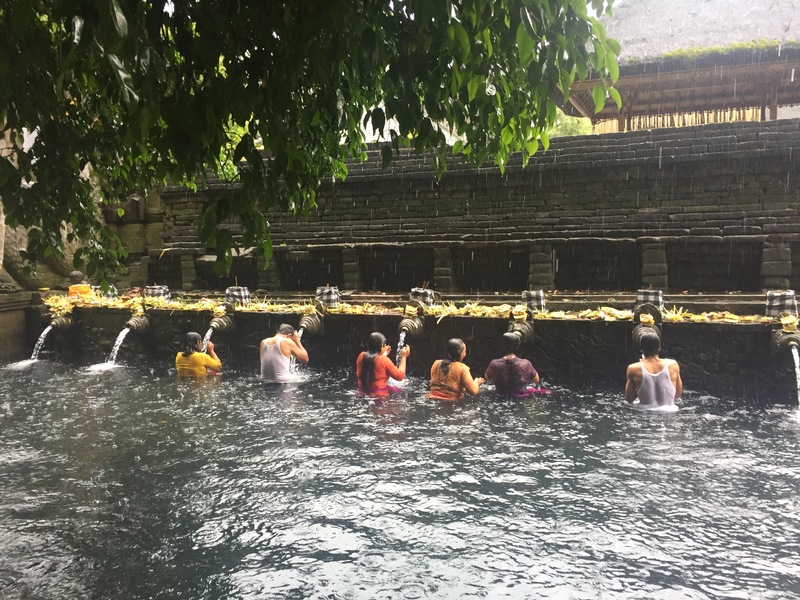 There are three purposes for this self cleansing: cleansing bad spirits (Tirta Gering), for prosperity (Tirta Merta) and for purifying the body and soul (Tirta Sudhamala) – you move under the different taps to experience all three cleanses. Despite the rain, which did mean my feet got very wet, it was a lovely place with a calm spirituality to it so I’m glad we went in. We probably would have tried going in the pools ourselves had we realised what it was before we got here – it was great to see people do it. Next was a Balinese housing compound which is in the traditional style of how people in Bali used to live. It had a family who still lived in the traditional way and you just made a donation at the end as a thank you for them letting you come in and look around. It’s called a compound because the rooms are all separate around the grounds – not connected like a house in the UK – and the kitchen still uses a wood burning fire to cook their meals. They have 2 porcupines (I think they were porcupines), a pig and chickens but I don’t know if the porcupines were to eat or were just their pets. Even though the housing compound was very basic, they still had a TV! There was also a family temple in the compound and this would be where weddings and funerals would also be held for that family. Our penultimate stop of the day was to go to the Taman Ayu coffee plantation. This place was really interesting and we were shown round by a young man who taught us about how they harvested the coffee and the fruit they grew. There were three types of coffee grown here with one of the coffees coming from an animals excrement (Luwak coffee). A Luwak is a bit like a Mongoose or Possom and the coffee comes from this animal excreting out the coffee beans after eating the fruit. They then clean it and roast it – we didn’t feel the need to try this one. The plantation also grows loads of different spices and fruits. I didn’t know that pineapple grew from the ground, that cinnamon was the bark and wood from a tree and that vanilla can only be grown in Madagascar and Indonesia. After the tour we were given a sample of 6 teas and 6 coffees to try for free. We don’t like coffee normally but there were some lovely ones especially the vanilla coffee and also the coconut coffee which was made with coconut cream. There were some lovely teas too, we particularly liked the lemongrass tea and mangosteen peel tea because they were both quite sweet. Unfortunately, because of how long we’re going to be away for, we couldn’t buy any of them in the shop. We ended our day with a Kecak and Fire dance in Ubud city centre after the sun had set. It was a strange performance! About 40 men sat in a circle and chanted while men and women in intricate outfits and decorated masks acted out stories about good and evil. It was a bit hard to follow even with a copy of the story in front of us but I was able to get the gist of it. There was also a Sangryang Dedari Dance which had two girls around the age of 10 dancing without opening their eyes holding a fan while a group of 20 ladies sang a song and men chanted. Finally, there was the Sanghyang Jaran Dance where a man danced around a bonfire on a wooden horse and kicked the bonfire around. A person at the front got hit my some of the fire which made us thankful we hadn’t been in the front row. The whole thing lasted just over an hour and would normally be part of Indonesian culture during celebrations (I think) so it was good we got to see it… I don’t think I’d go see one again though.